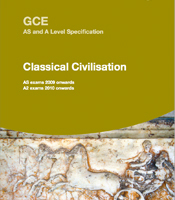 We are not developing a new A-level Classical Civilisation qualification due to government changes to A-levels. The study of A-level Classical Civilisation allows students to look at many aspects of the classical world which are significant in the development of the modern world. The Classical Civilisation A-level offers students a mid-level opportunity to engage with the study of classics. It also allows those who have the firm foundation of GCSE Classical Civilisation the opportunity to build upon the skills and knowledge that they have acquired. As well as being superb preparation for further study in the Classics, a study of Classical Civilisation complements many other popular A-levels including: Art, Drama and Theatre Studies, English Literature, Government and Politics, History, History of Art and Philosophy - as well as the study of the classical languages.